An away game Friday and a home game Saturday both ended in losses for the Panthers boys team. 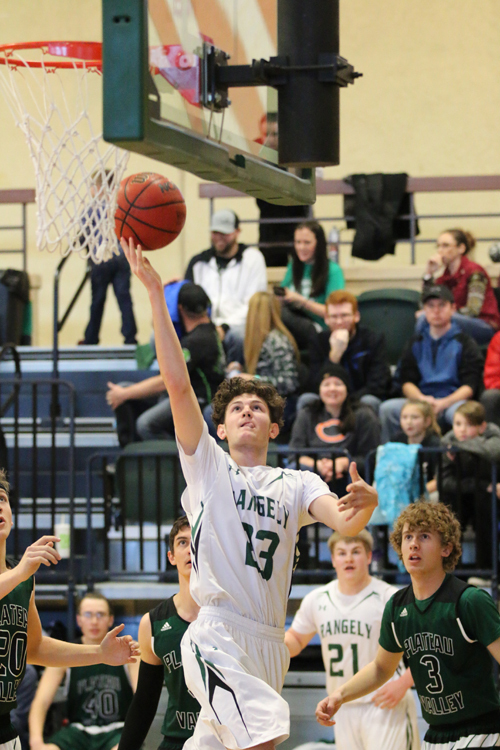 RANGELY | The Rangely boys basketball team traveled to Vail Christian on Friday, Jan. 11, and hosted Plateau Valley on Saturday. Vail Christian took Friday’s game 57-34. The Panther’s kept pace with an 11-12 first quarter score. Unforced turnovers allowed the Saints to blow the game open in the second quarter and Rangely was unable to answer. Marshall Webber led all scorers with 12 points, Sidney Cole pitched in eight points, and Micah Zenner chipped in six. Sydney Cole and Drew Brannan led the team in rebounds with six and five. The Panthers JV played two quarters and won 12-9. Gabe Polley and Timothy Scoggins each pitched in four points. Plateau Valley used the combination of their two big men, Stevenson Reynolds and Austyn Vig, to defeat the Panthers 48-28. Rangely trailed 15-25 at halftime. While scoring woes led to frustration for the Panthers, coach Kyle Boydstun said, “We have to keep our heads up and keep working. Vail Christian and Plateau Valley are two of the top teams in our league, so we knew these would be tough games. Overall, defense has been our strength and something we can build on—but we must find a way to limit turnovers and score.” Micah Zenner put up eight points, while Sydney Cole led the way with 10. Marshall Webber pulled down six rebounds. The Panthers JV won their matchup 37-28. Timothy Scoggins led all scorers with nine points, followed by Gabe Polley and Ryan Richens with seven points each. The Panthers continue league play Thursday, Jan 17 against Caprock Academy at home starting with JV games at 4:30 p.m. On Friday, Jan. 18, the Panthers travel to West Grand with JV games starting at 3 p.m.